- Aorta anterior to the spine slightly to the left. - IVC anterior and to the right of the Aorta. - J-shape of umbilical vein connecting to the left portal vein. So in the normal condition = "Situs Solitus" the A-P diameter of the abdomen drawn at this level will have the stomach and aorta on the left of the line and the IVC anterior to the aorta and on the right side of the line. From there sweep up to do cardiac examination. 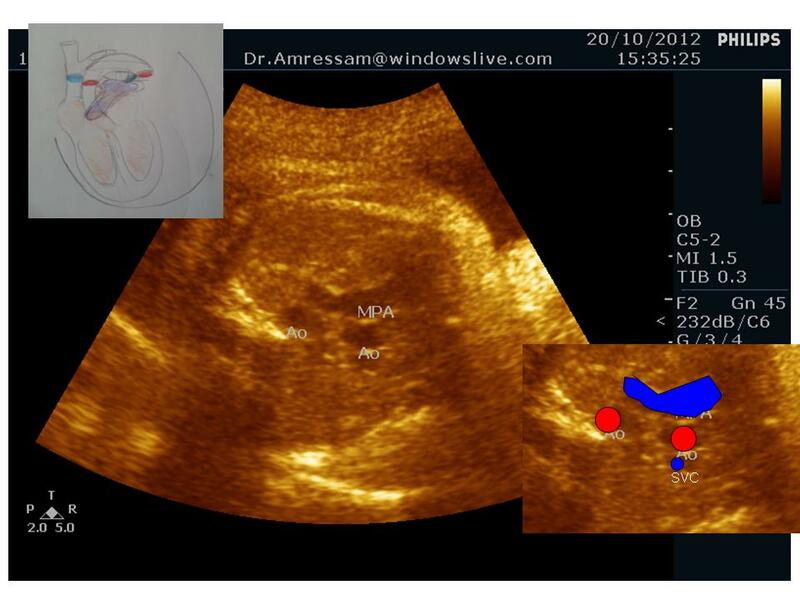 In order to do an efficient examination of the fetal heart during antenatal scan, it is important to use the standard fetal heart views, every obstetrician/ radiologist can view the fetal heart and identify some structures every now than then, but it is only through the standard views that you can truly diagnose an anomaly. 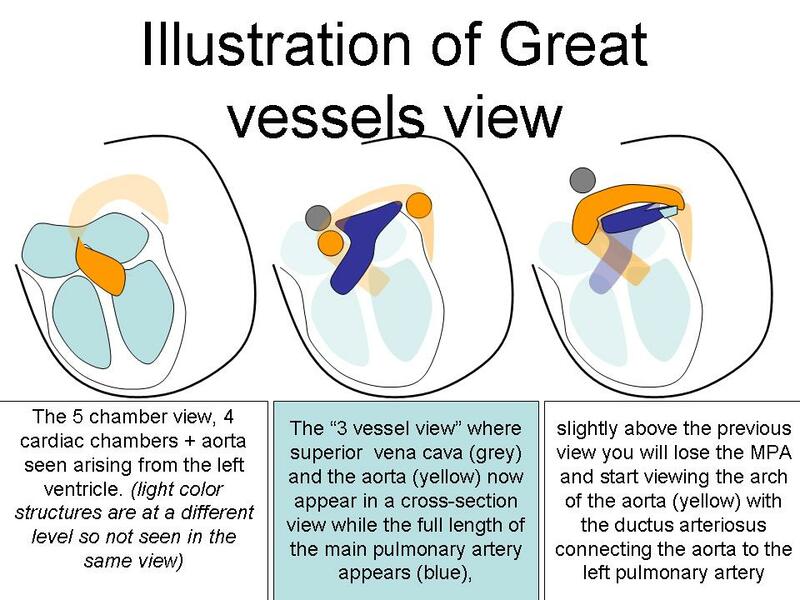 but actually the upper 2 views are overlapping so I prefer to refer to them together as "Great vessels view”. 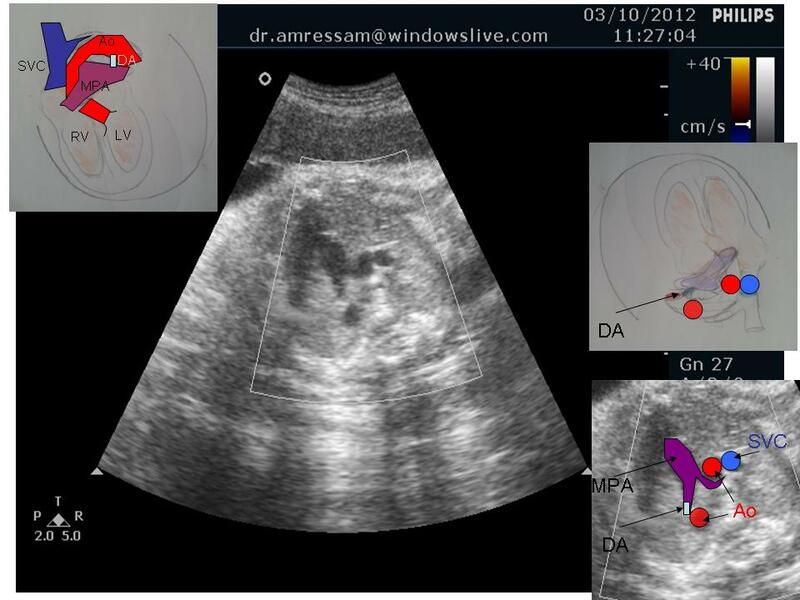 Each view is "just" above the other while sweeping the probe towards the fetal head. Start by having a good look below at illustration 1 demonstrating anatomy of the fetal heart and illustration 2 showing the three main views with relevant relation between the cardiac and vessel structures. In the transverse plane of the lower thorax the 4 chambers of the heart are seen. The right ventricle is the one with large contact with the anterior chest wall while the left ventricle is only in contact with the anterior chest wall at its apex, also the right ventricle is smaller as it contains the moderator band and the chorda is attached to the septum while in the left ventricle the chorda is attached to the free wall. When you can identify the ventricles then the right and left atrium are consequently identified. The ventricular and atrial septa are also identified and the valve leaflets are seen. It is worth noting that the tricuspid valve is slightly at a lower level than the mitral valve. The right atrium is located anterior and to the right of the left atrium which lies posterior over the spine. Scroll through 4 chamber view images and clips to identify the chambers. Much more images and clips of 4 chamber view are under "4 chmaber view category". 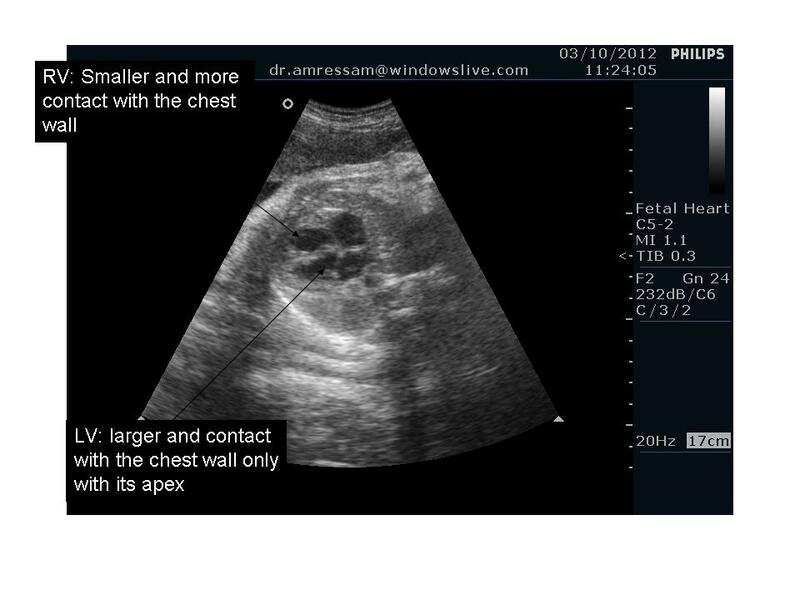 Position: Levopsition: the heart is anterior and to the left of the midline occupying approximately one third of the chest (The largest heart you will see is with Ebstein Anomaly), make sure you know where is the left side of the fetus before commenting on cardiac position. Abnormal cardiac axis is mainly seen in cardiac anomalies e.g. conotruncal anomalies and cardiosplenic syndromes, . both ventricles are almost of the same thickness while the left ventricle is slightly larger than the right ventricle due to presence of the moderator band in the right ventricle. Notice the rhythm and contractility of both ventricles. verify the attachment of the papillary muscle (septal in the right ventricle and free wall in the left ventricle). A variety of heart defects and anomalies are reflected in an abnormality of size of the cardiac chambers. The Atrial septum appears thin and shows the physiological defect of the foramen ovale which flaps into the left atrium . The inter-ventricular septum is thick and continuous except for its upper thin membranous part where the atrial and ventricular septa meet the mitral and tricuspid valve to form the crux of the heart. The tricuspid valve is at a lower level than the mitral (in the perfect 4 chamber view) the part of the interventricular septum above the attachment of the tricuspid valve is the Atrio-ventricular septum. 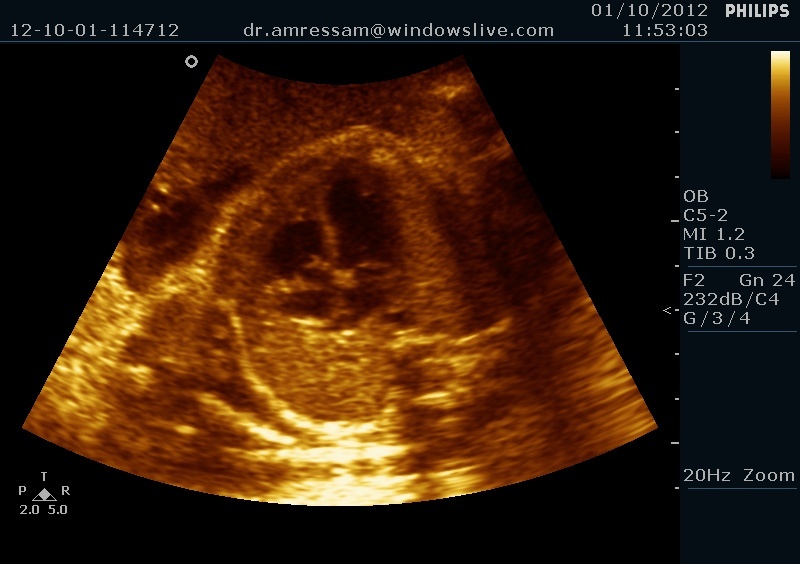 After identifying the 4 chambers in the previous view (the 4 chambe view), with a very gentle sweep of the probe towards fetal head you can see the aorta as a fifth chamber in the middle of the heart. This fifth chamber arises from the left ventricle and is directed to the right, if you sweep up you can not trace the aorta from this view to reach the aortic arch because this will soon be replaced by the Main Pulmonary Artery that runs above the aortic root and below the aortic arch and divides to the right and left branches. These views are very close and you will always find these views overlapping. My advice is to concentrate on finding the three vessel view and trace the structures from there, if the vessels are not clear try to tilt the probe and sweep to-and-fro till the vessels are clear. The aorta arises from the center of the heart and its wall is continuous with the ventricular septum. The Main pulmonary artery arises from the right ventricle and gives rise to the ductus arterious and the pulmonary arteries. 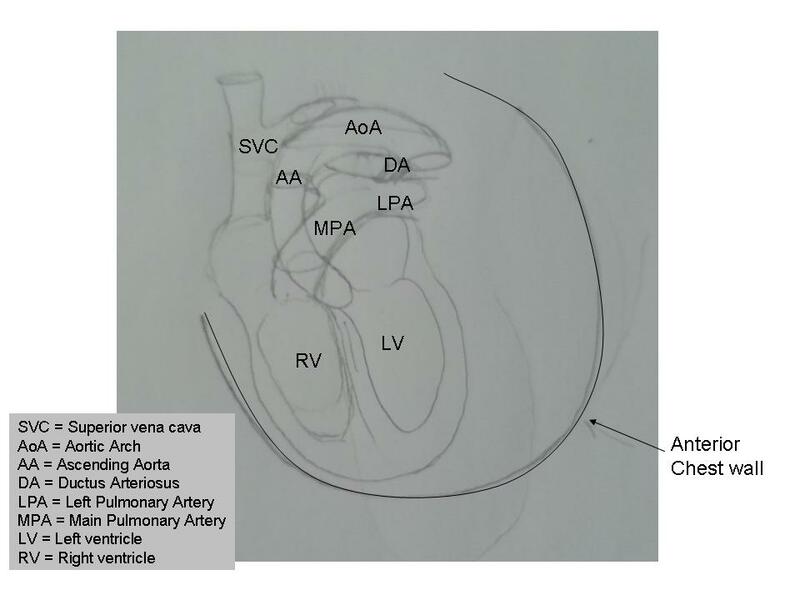 It is important to document the aorta and MPA crossing at their origin,, (if the vessels are parallel the D.D. is Transposition of Great Vessels, double outlet right ventricle, complex CHD with malposition of vessels). Much more images and clips of great vessels view are under "Great vessels view category". 4- Aorta and the MPA arise from the relevant ventricle and cross each other. Visit Obstetric and Gynecology Atlas and Gallery for detailed illustrations and ultrasound clips of fetal heart and cardiac anomalies.